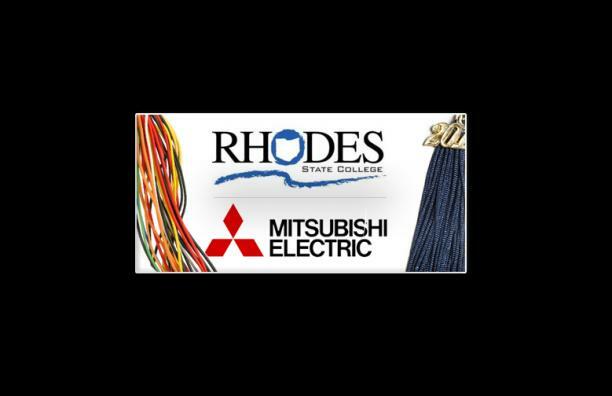 When Rhodes State College in Lima developed a partnership with Mitsubishi Electric Automation, Inc. to train manufacturing workers on the use of Mitsubishi Programmable Logic Controls (PLC), Rhodes State administrators knew it addressed a great need. Northwest Ohio has the highest concentration of Mitsubishi PLCs in the United States. With three Honda of America plants located within a 60-mile radius of the college, and more than 35 Tier 1 and Tier 2 Honda suppliers nearby, Rhodes State and Mitsubishi officials were confident manufacturers would welcome a regional training solution. The Mitsubishi Training Center at Rhodes State College provides that. As Ohio’s only certified Mitsubishi Electric Factory Automation Training Center, workers can get the training they need without an overnight trip to Mitsubishi’s headquarters in Vernon Hills, Ill. The result? Employers save money and Rhodes State strengthens its ability to train workers in advanced manufacturing jobs. Since opening in July, the Training Center has added a new class and additional sessions of existing classes, and started to provide training on two other brands of PLCs. To date, 11 companies from three states have sent workers for training. Margo Meyer, director of advanced manufacturing initiatives for Rhodes State, said companies are “calling us saying we want training more frequently, and we are adding courses to meet their needs.” To date, Meyer estimated that by offering those classes locally, Ohio-based employers have saved $30,000 in travel costs. The Training Center, equipped with state-of-the-art Mitsubishi PLC and Human Machine Interface (HMI) trainers, was created through a public-private partnership supported by $117,000 in Ohio Board of Regents’ Non-Credit Workforce Development Grant money. Mitsubishi provided equipment at cost, faculty training, and ongoing system updates. Rhodes State provided the facility and instructors, and the Ohio Manufacturing Extension Partnership (MEP), of which Rhodes State is a member, provided the tools to outreach to local industry. A key requirement of the training was to replicate and maintain the quality content, delivery and equipment that are the backbone of the standardized Mitsubishi Training Center philosophy. After the Training Center successfully launched, Procter & Gamble Manufacturing Co.’s Lima Plant approached Rhodes State about offering factory automation training for its plant workers. The plant and distribution center produces several brands of liquid detergents and softeners, including Tide and Downy. The facility has been called the largest fully automated logistics center in the world. The plant uses Allen Bradley brand PLCs and automation devices. So to fulfill the training request, Rhodes State partnered with Northwest State College, another MEP member. Northwest State provided the equipment and instructors. Rhodes State offered the training room and the customers. To date, 10 classes for P&G workers have been held. Meyer said the Training Center opens more space to provide different types of non-credit workforce training. Customer requests are driving demand for more types of classes. In 2014, the Center expects to add classes in human machine interfaces (HMI), Siemens brand factory automation devices, and factory automation troubleshooting and maintenance.